Charlotte has attracted a number of boutique architects and developers, who design just one or two luxury communities, which are immediately classified as luxurious simply by virtue of their style, high-end appointments and location. Many of these are scattered throughout Charlotte, some of which command fairly high prices. In 2011, however, we are seeing quite a movement to affordable luxury homes in Charlotte. Despite the fact that Charlotte was, and still remains, one of the most stable real estate markets in the nation, we have seen a significant dip in all home values as well as a significant increase in supply, contributing to making luxury homes in Charlotte more affordable. Finding a more affordable million dollar property in Charlotte NC with all of the bells and whistles, is not as difficult as it once was! A drastic reduction in mortgage rates, as well as home price reductions/values in the area are giving way to Charlotte luxury home buyers’ dreams. If you’re seeking to make a sound investment in luxury properties in the Charlotte NC area, now is truly the best time in decades to make that investment. What will a million dollars buy you in Charlotte NC? 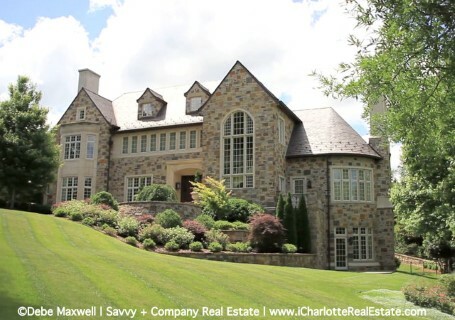 Let us help you find your million dollar luxury home in Charlotte NC – we are Charlotte luxury home specialists. What defines luxury in a Charlotte NC luxury home? Luxury is in the eye of the beholder–the owner. Charlotte luxury homes vary widely in their styles and prices but, there is something for everyone, on every level of luxury, here in the area! **The home at 1800 Smarty Jones DR (pictured top left above) was listed and SOLD at $1,165,000–5 Offers on this property in less than one week on the market! A win for the lucky buyers for the over 9,100 square feet of amenity-filled luxury in popular Providence Downs South!